Now, this is what I like to see! A big fish with long jaws packed full of sharp teeth. No messing around. You know where you are with a Gar. You're in danger of losing a finger. Or maybe you'll get eaten and there'll only be a finger left? Oh, alright... so a Gar probably won't eat you. They're not one for tackling prey anywhere near their own size. They would rather swallow small things whole than have to bother slicing and dicing a huge mound of dinner into more manageable chunks. And this is good, because some Gars are bigger than people! There are seven species of Gar, all belonging to the Lepisosteidae family. To gargantuan. 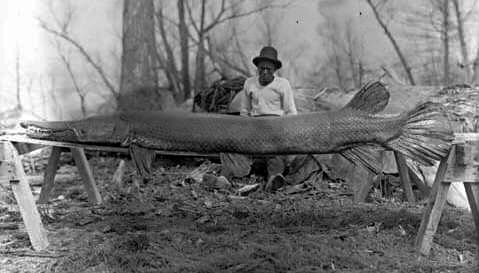 The Alligator Gar is the biggest of them all, with anecdotes indicating lengths of up to 3 metres (10 ft). The biggest one ever caught and officially measured was 2.5 m (8.5 tt) long. HUGE! Most Gars live in south-east United States. The most widespread of them all is the Longnose Gar which can be found from Quebec all the way down to Mexico. I guess it pays to have a long nose when the "nose" in question is actually a snout full of teeth. The Tropical Gar takes over where the Longnose stops, since it lives throughout much of Central America. And then there's the Cuban Gar, found only in western Cuba. For ideological reasons? Wherever they are, Gars prefer lakes and slow-moving rivers where they can skulk around among vegetation. They may also saunter into brackish waters and a few might even get into the ocean, but they're mainly freshwater fish. Although the water doesn't have to be all that fresh. 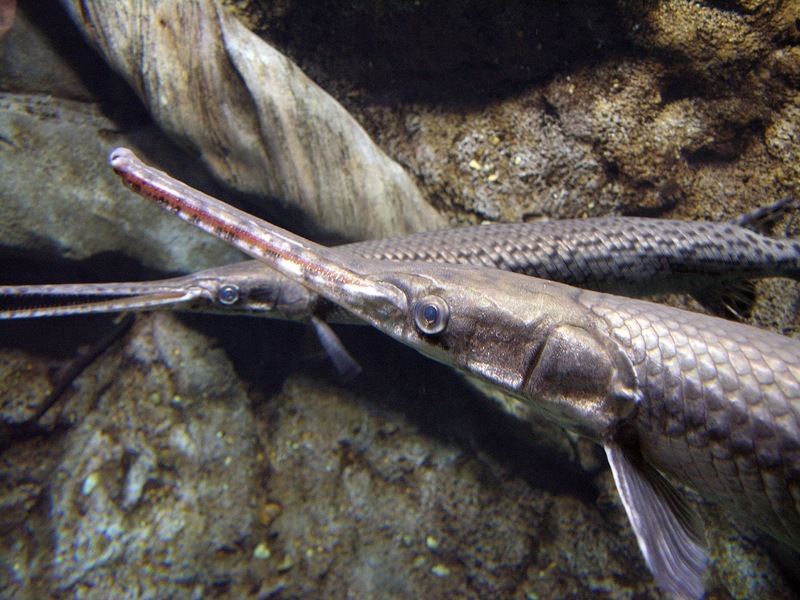 Gars can survive in stagnant and oxygen-deprived waters because they can breathe air. Their gut is connected to the swim bladder by a tube, meaning a Gar can rise to the surface, swallow a gutful of air and then use the swim bladder as a kind of lung. Perhaps it's not surprising then to learn that Gars are careful about their use of oxygen. By which I mean they're lazy. 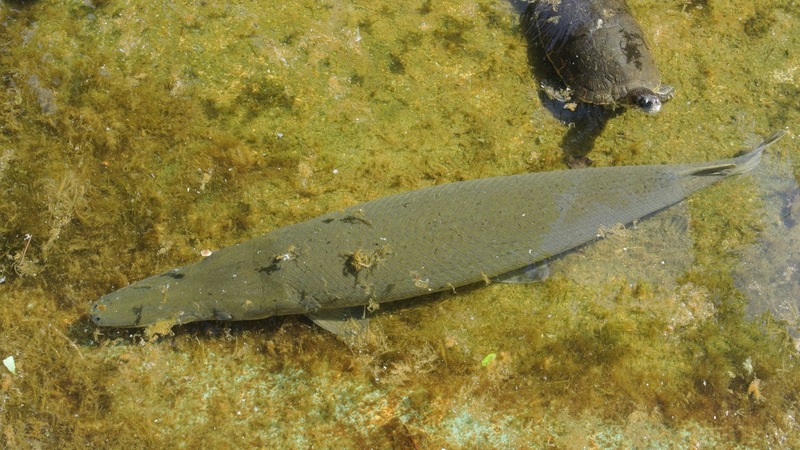 Gars are usually sluggish and not terribly enthusiastic about swimming or moving around. Until they come across something to eat, that is. Once they approach a fish or a crab or, as a special treat, some kind of waterfowl, they flick the switch. Suddenly the Gar becomes a veritable athlete, lunging at their prey with a burst of speed and grabbing hold with their impressive collection of teeth. 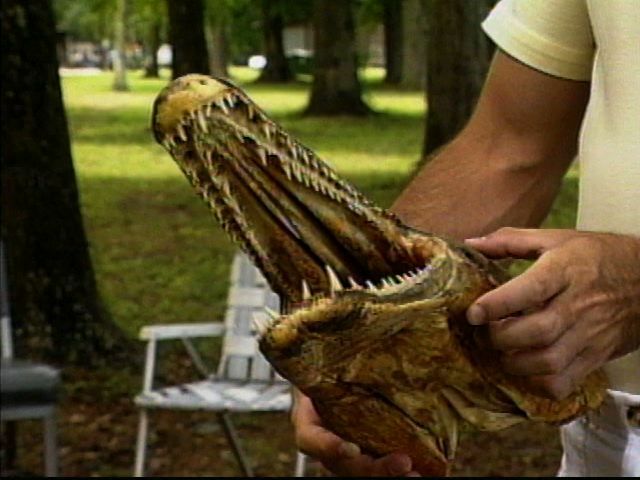 Most Gars have a single row of teeth on each jaw, but that just wasn't enough for the enormous Alligator Gar. They have an extra row of teeth on their upper jaw, as if there's a whole other Gar in there! But it isn't all teeth and eating. It's mostly teeth and eating, but there's a little more to Gars than just that. For one, it must be noted that these are ancient fish. Fossil Gars have been found all over the world, dating back as much as 100 million years to the Cretaceous Period. Modern Gars to this day retain a host of characteristics that harken back to their old, globe-trotting days. The most obvious one is their covering of thick, diamond-shaped scales which inspired the family name Lepisosteidae - it comes from the Greek words for "scale" and "bone". Each scale is made up of three layers: a bony layer at the bottom, a layer of dentine (which is the main stuff in our teeth and the second hardest tissue in our bodies) and then a top layer of a bone mineral called ganoine (a bit like the enamel which covers our teeth and is the hardest material in our bodies). Gars are, in a way, covered in a suit of armour made out of teeth! As I say, mostly teeth and eating. If we can get past all the teeth we will find that a Gar's tail is heterocercal. That means the backbone extends right up through the tail fin. It's a common condition among the more venerable lineages of fish, such as sharks and Sturgeons. And, like sharks and Sturgeons, Gars also have a spiral valve. This is a bit of intestine where the inner lining is shaped like a corkscrew. Food has to spiral round and around so the Gar can absorb all the nutrients despite having a rather short intestine. 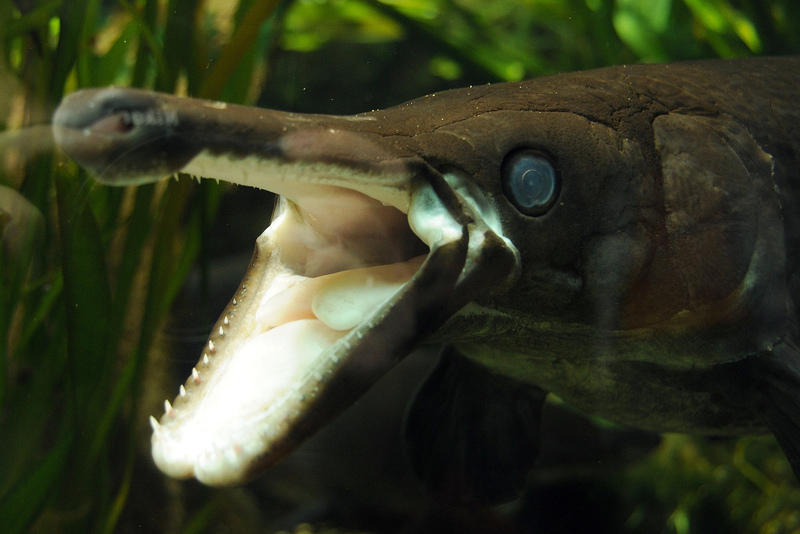 Unlike Sturgeons, and moving away from teeth and eating at last, Gar eggs are poisonous. There's no caviar here, I'm afraid! Females lay tens of thousands of sticky eggs that adhere to vegetation. 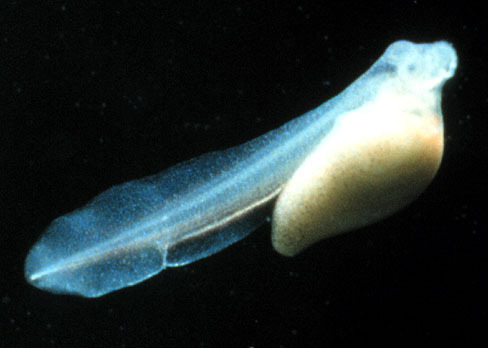 They hatch within a few days to reveal tiny larvae, each with a yolk sac and a sticky disc on their snout. They use that disc to stick to plants and rocks and just relax for a week or two while they absorb the yolk. Soon they're developed enough to start hunting for copepods and other minute prey. their sheer size along with those thick scales will protect them from most predators. Many species will have to wait a few more years before they're old enough to breed and they may live for 20 or 30 years. There can be no better mascot for good dental hygiene than a Gar. prehistoric beasties! gotta love 'em! Also, I'm glad they're mostly freshwater fish. The United States has a ban on Cuban sea-gars. Thank you, I'll be here all week, try the veal. @TexWisGirl: Yes, I love those big, ancient jaws! @Porakiya Draekojin: Hahah! I couldn't possibly comment. @Crunchy: If it was a dolphin it would look like he was laughing. But it's a gar so it looks like a threat. Bright and Beautiful. And Spiky.